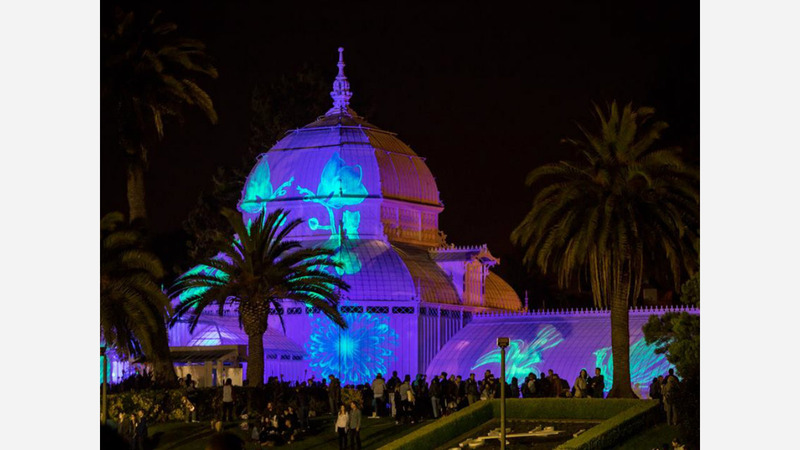 This Wednesday, the city's Rec and Park department is hosting a second free summer solstice concert at the Conservatory of Flowers, with a long roster of music legends and contemporaries, as well as food trucks from Off the Grid and a psychedelic light show. Dubbed a "Psychedelic Photosynthesis and Surrealistic Summer Solstice Jam," this week's concert will last from 6pm Wednesday until around 10, or shortly after the ceremonial lighting of "Photosynthesis," the tripped-out psychedelic light show that's been playing across the conservatory's outer skin nightly since it went up last summer. Installed in collaboration by local Obscura Digital and Illuminate (the group behind the Bay Lights project), the light show was initially meant to last only last summer as a send-off for the 50th anniversary of the Summer of Love. Like the light show, the concert -- free, and open to the public -- is a kind of homage to San Francisco's past. "The concert," announced Rec & Park, "will revisit iconic songs of 1968 featuring legendary artists alongside new bright talents in the Bay Area music scene." Some of the performances are slated to include musicians from seminal rock acts: Big Brother & The Holding Company, Jefferson Starship, Jerry Garcia Band, Sly and the Family Stone, and many others. It'll also feature work from contemporaries like ALO, Box Set, Brothers Comatose, Con Brio, Cosmic Twang, Midnight North, Mother Hips, and Tarnation. JFK Drive will be closed from Kezar Drive to 8th Avenue all day Wednesday, so plan your morning commute accordingly and remember to take public transit if you're attending the festivities.